The lecturers of Digital Methods of the University of Amsterdam Media Studies department organized a Data Sprint week in collaboration with Hope not Hate of London and Political Science at the University of Amsterdam for the students of the New Media and Digital Culture master. The main goal of this week is to investigate what the Internet adds to the study of extremism and Counter-Jihadism online. Counter-Jihadism is a political and extremist anti-Islam movement. Terrorism has instigated and revitalized anti-Islamic movements and parties, especially since the 9/11 attacks. Such a movement is the English Defence League, a right-winged organization in the United Kingdom that protests against what it considers the ‘spread of the Islam’. Hope not Hate has stated that the EDL is the “largest right-wing threat in the UK today”, which mobilizes “between 100 to 3000 supporters in the streets” (Hope not Hate, the ‘Counter-Jihad’ movement). This report by Hope not Hate, an organization that campaigns to counter racism and fascism, is “the largest and most comprehensive survey of groups and individuals who comprise the ‘Counter-Jihad’ movement to date” and provides an interesting example of how Counter-Jihadism can be studied. Internet studies towards the online activity of such extremist movements and parties can contribute to the study of Counter-Jihadism, particularly with regard to social media platforms. Sunstein (2001) has written about online groups and group polarization with regard to extremism. Today, movements actively participate on Twitter and Facebook, where they have followers and members on group 'pages'. Investigation into these pages provides valuable information about the supporters of these movements, their popularity and the content that is shared on these pages. This content can be used for analysis and monitoring. In this study two large English Defence League Facebook pages will be analysed, one moderated and one non-moderated. This will be done in order to investigate what types of content are most engaged with in terms of likes, comments, likes on comments and shares, and what the main differences are in content and engagement between the two pages. The content we will focus on are posts. Posts consist of four categories: status updates, photos, videos and shared links. We will extensively look into the most engaged-with types of content to see what information they contain and how this is received, to attempt to derive an understanding about why certain types of content are more popular than others. While analysing this, we will pay attention to the characteristics and dynamics of both Facebook pages. What content on Counter-Jihad Facebook pages that are related to the English Defence League generate the most engagement? 'Engagement' is understood here as the total of shares, comments, likes and likes on comments with regard to a post. By posing this question we hope to gain more insights into what type of information is popular within the moderated ((EDL) English Defence League) and non moderated (EDL) Counter-Jihad pages on Facebook. 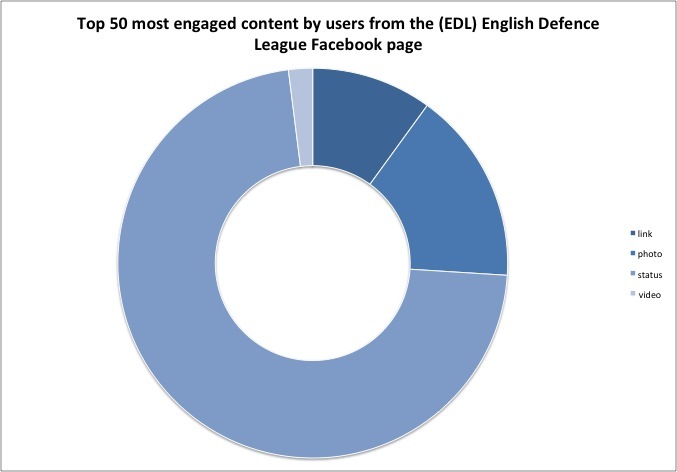 For this study, we focused on the two largest English Defence League Facebook pages: the “(EDL) English Defence League” page and the “EDL” page. The (EDL) English Defence League page has 14.411 Facebook likes on 21-01-2013. Only the page moderator can publish posts in this group. Users can like, share and comment on these posts. The EDL page has 38.427 Facebook likes on 21-01-2013. Users can publish posts and like, share and comment on posts on this page, there is no active moderator on this page. Facebook: our study was based on the social media platform Facebook and its pages. Netvizz: the Facebook application Netvizz is designed to obtain data from a user's Facebook profile, the pages the user has liked and the groups the user has joined. This data can be used for analysis and research. Excel: the obtained data from Netvizz was opened with and explored through Excel. Wordle: the word cloud tool Wordle was used to create word clouds from some of the data obtained through Netvizz. Gephi: the Netvizz data was also explored through the open source graph visualisation tool Gephi. Gephi enables users to visualise and explore networks and complex systems through dynamic and hierarchical graphs (Bastian, Heymann and Jacomy). In Gephi we analysed the user engagement by visualising the network of user interaction relating to posts. We used a previously created fake Facebook account to perform our research. Using this account, we searched for Facebook pages and groups on the English Defence League and 'liked' the two most liked pages. This allowed us to apply the Netvizz Facebook application, from which we obtained data of both pages that we could run with Excel. The app generates the statistics of the page posts: the amount of likes, comments, likes on comments and shares of each post in combination with the (anonymous) user statistics of interaction with the page and the contents of each of the posts. Posts are photos, links, videos or status updates. The graphs were created out of the 50 most engaged-with posts of the past 300 posts. After obtaining the data and statistics, word clouds were created of the top twenty most engaged-with posts in order to visualise the most frequently used words in these posts. This derives a certain tone of voice that can be attributed to each page. Gephi was used to visualise and analyse the obtained data. The top ten most-engaged with posts were explored on the Facebook pages, so that we could investigate the contents of these posts. With the Netvizz data from both Facebook pages, several Gephi visualisations were made to display user activity regarding the top fifty most engaged-with content. The minimum number of interactions with the page was first set to one, then ten, twenty and thirty in order to visualise the most core of active users. Coloured dots are posts, blue noise is user interaction between these posts. When gradually adjusting the minimum interaction from one, to ten, twenty and thirty it is apparent that there is a very large, active core of users on this page. Interactions refer to engagement, and thus contain shares, likes, comments and likes on comments. This is notably different in the case of the EDL page, where the amount of users decreases considerably after adjusting the minimum interaction from one to five. In the graph below the green noise is the user interaction between the posts. 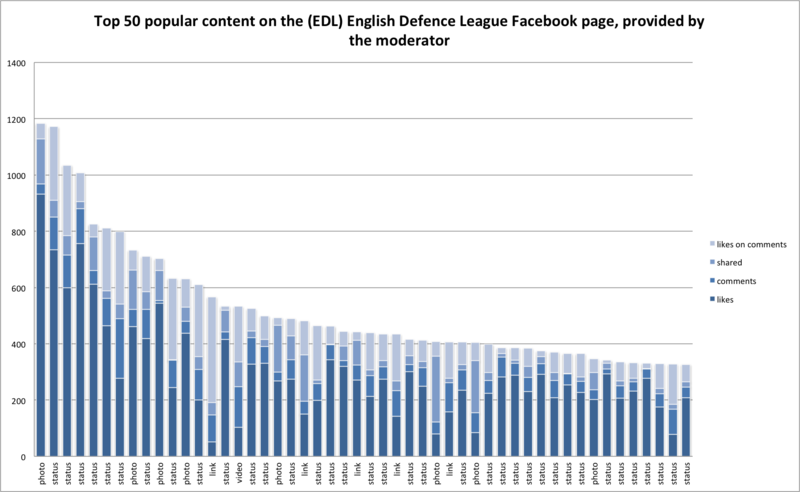 It shows us that the average user of the moderated (EDL) English Defence League page is far more active than the average user on the non-moderated EDL page, which has far more users that only interact with the page once. Further, the visualisations make clear that the moderated page knows a large and active core of users, something that cannot be recognized in the non-moderated page. These pie charts show what type of content is most engaged with by users, based on the top fifty most engaged-with posts on both Facebook pages. It demonstrates that on both pages, users engaged the most with status posts in terms of shares, likes, comments and likes on comments. These graphs visualize the most engaged-with content of both English Defence League pages and give an idea of what types of content and engagement occur most. We focused in particular on the top twenty most popular posts to explore more in depth the content of these posts by creating two word clouds. When comparing these word clouds, a lot of common topics are visible. Other than slight differences in frequency of word usage, the words and subjects are fairly similar. This asks for further investigation into whether the topics are treated similarly on both pages as well. In other words, what is the actual content that is discussed? To investigate the specific content of the most engaged-with posts from both Facebook paged we decided to focus on the top ten posts, of which the top four of both pages are displayed below. The moderated page displays messages that are provided by the moderator and seem to have a goal; they are specifically meant for positive engagement from the users and ask for support. On the contrary, the posts on the non-moderated page can be considered more random and are in general shorter. It is notable that a lot of the most engaged-with messages are critique or negative comments towards the English Defence League. 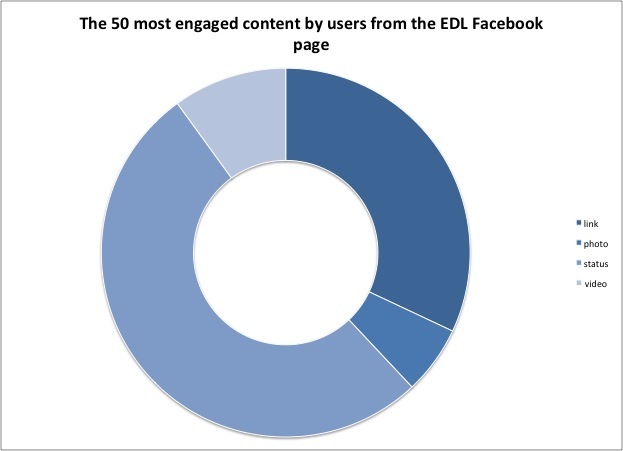 Comparison between the top fifty most engaged-with posts of both Facebook pages shows that on the (EDL) English Defence League page’s most engaged-with content is mostly liked, and on the EDL page most engaged-with content is mostly commented on. Where likes are in general a sign of positive engagement, comments can be either positive or negative. This could be an indication of positive engagement or popularity of content amongst users, where content of the (EDL) English Defence League is more positively received compared to content of the EDL page. 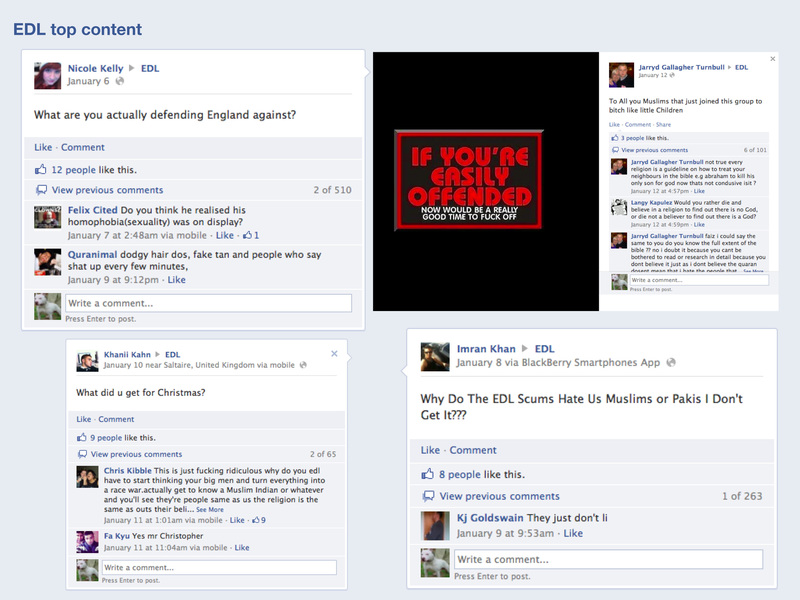 Further, content on the (EDL) English Defence League page is more often shared than content on the EDL page. This could also be an indication of positive engagement amongst users. Furthermore, the differences in likes and shares could also indicate a difference in the style or content of the posts on both pages. This could possibly be linked to the fact that posts on the (EDL) English Defence League page are published by the moderator of the page, while posts on the EDL page are published by its users. A moderator may have other intentions than regular users, for example the transmission of certain messages and the call for participation from supporters, while users publish a lot of different types of posts, such as questions, critique, nonsense amongst other things. These differences in group dynamics between the moderated and the non-moderated Facebook pages relate to the pyramid model of Activism and Radicalization as introduced by Clark McCauley, discussed by Peter Knoope on the introduction symposium of the Data Sprint Week. 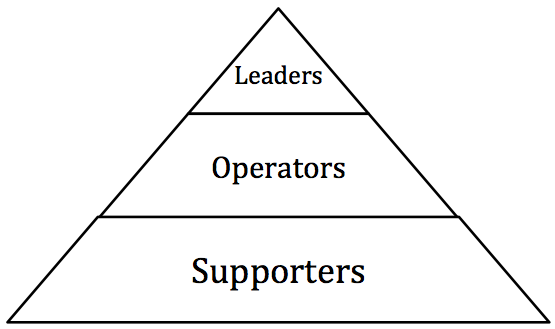 On the top there are leaders, followed by operators and supporters. Such a ranking/order can be recognized in the Facebook pages. On the moderated page, the moderator can be considered an operator, who supports the network and potentially recruits supporters. 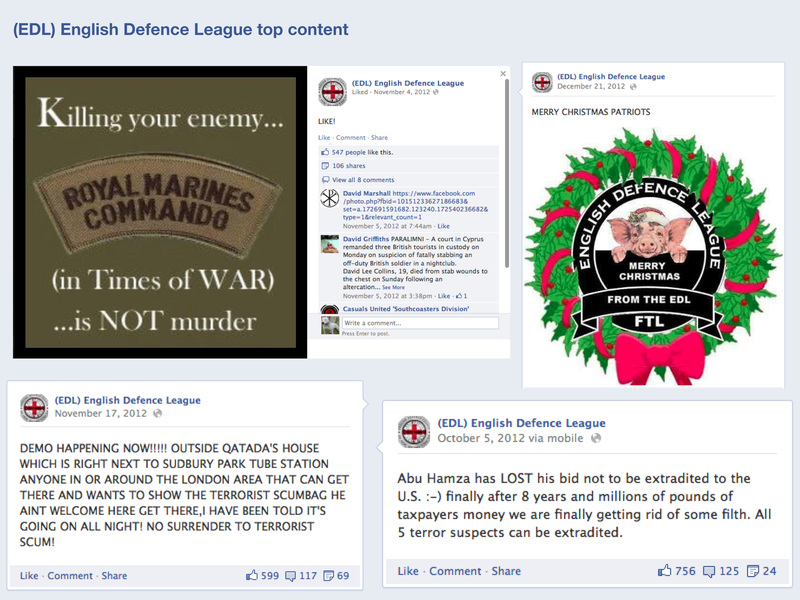 The users on the page can be seen as supporters, who justify and/or agree with actions from the English Defence League. In contrast, the non-moderated page shows only users, which are the supporters. There is no (visible) presence of an operator who runs the page. The findings in different group dynamics between the two pages with regard to content can also be brought into relation with what Sunstein has written about online groups and group polarization. In 2001, Sunstein wrote: “many of the emerging technologies are extraordinarily social, increasing people’s capacity to form bonds with individuals and groups that would otherwise would have been entirely inaccessible. E-mail and Internet discussion groups provide increasingly remarkable opportunities, not for isolation, but for the creation of new groups and connections” (57). This is notable in the English Defence League Facebook pages. While we only focused on two pages in this study, there can be found far more English Defense League pages on Facebook. Users that support one or more of these groups are therefore connected to other users with similar opinions, which leads to the creation of new connections. Sunstein has also pointed out that “the Internet is serving, for many, as a breeding ground for extremism, precisely because like-minded people are deliberating with greater ease and frequency with one another, and often without hearing contrary views” (71). More specifically regarding the differences between moderated and non-moderated content on the Facebook pages, the ideas about (online) group polarization mentioned by Sunstein seem striking. He has described group polarization as: “after deliberation, people are likely to move forward toward a more extreme point in the direction to which the group’s members were originally inclined.” He continues: “with respect to the Internet and new communications technologies, the implication is that like-minded people, engaged in discussion with one another, will end up thinking the same thing that they thought before - but in more extreme form” (65). With regard to this, Sunstein has described that the degree of identification with the group or its members is of influence in this process. “If you are participating in an Internet discussion group, but you think that other group members are significantly different from you, you are less likely to be moved by what they say. … If identity is shared, persuasive arguments are likely to be still more persuasive; the identity of those who are making them gives them a kind of credential or boost. … If you think that group members are in some relevant sense different from you, their arguments are less likely to be persuasive, and social influences may not operate as much or at all” (70-71). This might be recognizable in the two investigated Facebook pages; at the (EDL) English Defence League page, only the moderator publishes posts, which seems to be more positively engaged with mostly in terms of likes and shares, compared to the most engaged-with posts on the EDL page published by users, which have received almost no likes or shares. As it seems likely that users identify more with the moderator than with random users, this could possibly explain the what seems a more positive engagement with content on the (EDL) English Defence League page than on the EDL page, when considered likes and shares as positive engagement with content. To discuss our findings on a meta-level, what does this social media study on Counter-Jihadism add to research on extremism and Counter-Jihadism? Using social media platforms to study groups and organizations allows you to infiltrate into these groups, something that is possibly more difficult to do offline. Further, in contrast to offline conversations and meetings, everything that is said and reacted on is saved and thus can be used for analysis. This study compared two English Defence League Facebook pages whereof one page is moderated and the other is not, which resulted in remarkable differences in content between the two pages. The moderated page contains mainly politically oriented posts, directed towards the supporters of the group in order to communicate a certain message. The ability to infiltrate online communities also has as a consequence that Facebook users with opposing views can relatively easy access English Defence League Facebook groups and leave anti-EDL messages, something which influences the dynamics of the communities. It is safe to say the EDL page functions more as a forum, than the moderated (EDL) English Defence League page, which can be considered more of an activist page. The aspects of a forum also entail the possibility for opposing views, enabling users to criticize EDL supporters within their own space. 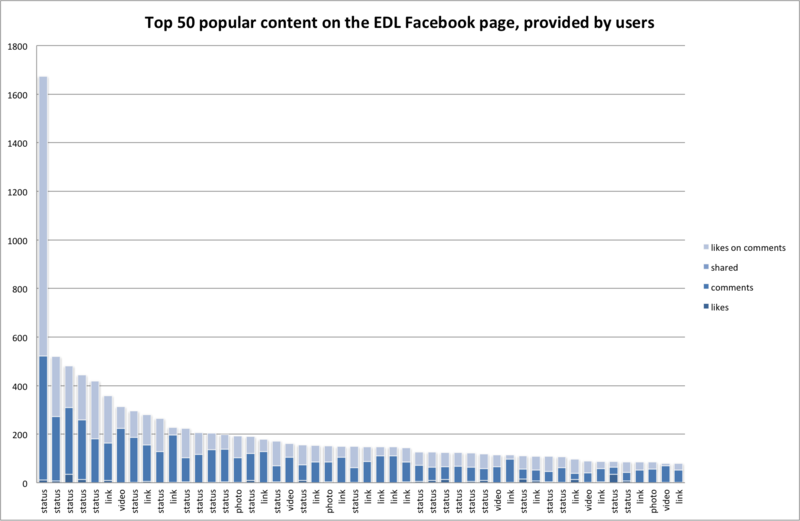 This is notable in when looking at the top three most engaged-with posts on the EDL page, which are all anti-EDL. As an idea for further research that builds upon this report, research could be done on how online content influences offline events. It would for instance be interesting to analyse what effect Counter-Jihad related events that were organized through social media have had on the movement. Bastian, Mathieu, Sebastien Heymann, and Mathieu Jacomy. “Gephi: An Open Source Software for Exploring and Manipulating Networks.” International AAAI Conference on Weblogs and Social Media. 2009. McCauley, Clark. “Models and Mechanisms of Group Radicalization.” National Consortium for Study of Terrorism and Responses to Terrorism (START). 2007.